Facebook may be trading deep into bear market territory, but the stock is extremely oversold and is testing its technical 'reversion to the mean' at $134.83. Facebook (FB - Get Report) may be trading deep into bear market territory, but the stock is extremely oversold and is testing its technical "reversion to the mean" at $134.83. This is my buy level! Since setting its all-time intraday high of $218.62 on July 25, the stock opened Thursday at $133.82, down 24.2% year to date and deep into bear market territory, 38.8% below the high. The stock is above its 2018 low of $126.85 set on Nov. 20. Despite the turmoil that clouds the future for the stock, keep in mind that Facebook remains the leading social media platform on the planet. It's not just Facebook as its other platforms are doing well, such as Instagram, WhatsApp and Messenger. Overall, the company should continue to generate a significant portion of the digital advertising market and will likely show an increase in products sold on Facebook for the holiday season. What is the technical "reversion to the mean" and why is it important? As a pure chartist, I have been looking at the 200-week simple moving average for more than 30 years. A chart of a stock is the summary of how the ticker traded in the past and as such it's the summation of all bullish and bearish events for the stock. It's a simple observation that a stock will eventually decline to or rebound to its 200-week SMA, hence its "reversion to the mean" or average of the last 200 weekly closes. 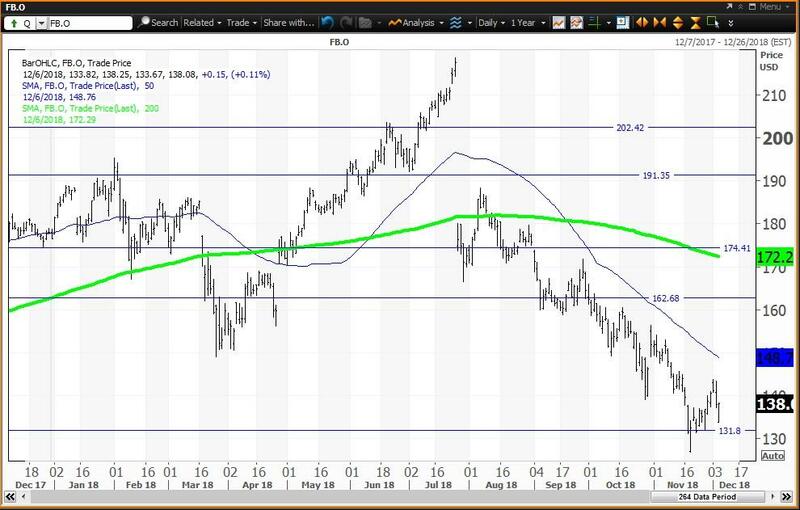 The daily chart for Facebook shows a huge price gap lower on July 26 after the all-time intraday high of $218.62 on July 25. The stock was in recovery mode following the Cambridge Analytica scandal. Then came a warning on revenue growth in their July 25 earnings report that resulted in the huge gap lower. The stock gapped below my semiannual pivot at $202.46, which is the highest horizontal line. The second line from the bottom is my annual pivot of $162.65, which was a magnet between Sept. 6 and Oct. 3. Thursday the stock is above my value level for this week at $131.77. The weekly chart for Facebook is negative but oversold with the stock below its five-week modified moving average of $144.39. Note how it traded around its 200-week simple moving average at $134.83, which is the "reversion to the mean," since the week of Nov. 23 when the stock traded as low as $126.85 on Nov. 20. The 12x3x3 weekly slow stochastic reading is projected to end this week at 15.49 below the oversold threshold of 20.00. Note that when the stock set its all-time high on July 25 the stochastic reading was above 90.00 at 93.47, which I describe as an "inflating parabolic bubble" - the first technical warning that justified reducing holdings. During the week of Oct. 19, this reading was below 10.00, at 7.94, which made the stock "too cheap to ignore". 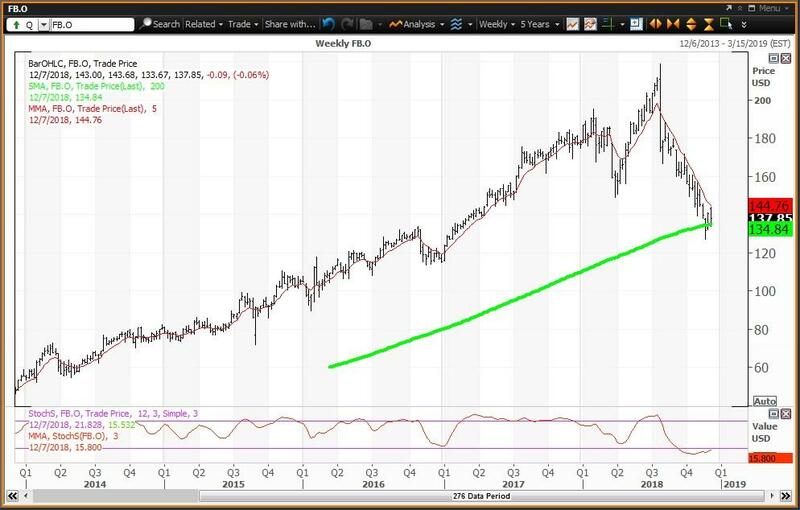 This justifies increasing holdings at the "reversion to the mean," which is the 200-week SMA. Investors should buy Facebook on weakness to its 200-week SMA at $134.83, which was tested at today's low of $133.67. Given an oversold consolidation, reduce holdings on strength to my annual pivot of $162.65.